Is Thighfriend deployed and allowing mike to breathe underwater? Deployed; but acting as his lungs, is questionable. You can see Thighfriend deployed in the last panel of the previous page, so yes. Also: hi, Thighfriend! Long time no see! I’m guessing Kallakore took it out intentionally. There’re plenty of reasons she wouldn’t want Mike to get back to the surface. But he’d have to have taken it off long before he met Michael. Ah, he looks so vulnerable in the last panel. Kallakore’s not just talking about LEVi here, is he? Those hand-legs are stronger than I thought. Is Mike hurt? Will he get a new fungus? So how did Kallakore recognize Mike? He could have been any human, but Kallakore called him by name. Did LEVi have the capability of displaying images? Would Kallakore even understand what an image is, and how it relates to the object it depicts? How is Kallakore talking to Mike under the water? Is he really talking via sound waves, or is it telepathy? If it’s telepathy then he probably read Mike’s mind. Sound carries far and its direction is hard to distinguish, but since there seems not to be any other noise in this basin and Kallakore is close by, Mike should be able to understand something. The only things necessary are a mouth full of water, and not releasing too much air while speaking. It’s also possible with a scuba respirator in the mouth if you don’t exhale or inhale at that time (no mouth full of water in this case), tough that makes pronunciation harder. Of course some consonants won’t work well, but it’s possible to figure things out. Anyways, I’m curious too if there may be more behind. If you have a lung full of liquid, I’m pretty sure your vocal folds won’t be able to resonate at any reasonable frequency to call it talking (or resonate at all, for that matter, considering the probable speed with which you can expel liquid from your lungs). It was designed for working with gaseous fluids (the Reynolds number would be way off). Trying to work out the timelines here. He’s been on Mars for 12 months with LEVi, studying tunnels and making movies/shows. Goto said she’d been accomodating to him for the past few months so we can probably put it down as LEVi being missing for about 3 months. Thats three months to get down there, teach Kallakore everything, get wrecked underwater and corrode. Checking for pictures of wrecked cars underwater, it shouldn’t really be that bad. But thats not regular water. Mike commented that the air AND WATER are both highly sulfuric and sulfur will corrode things quickly… There’s also the strange fact that Mike’s facial hair seems to have exploded with growth after he splashed his face once with the water. Wait… Is Kallakore looking right through the back of LEVi and out the front window at Mike in those last two panels? I still find it a great pity that we didn’t see LEVi in action. My only remaining hope is that the LEVi 1.0 AI made the call to power up and head after them, due to threat on their lives, and we get a side story of it working with Bex. Heh, no doubt we’ll likely get some prequels with LEVi… I wonder if poor Bex even knows how to work with LEVi properly. She’s seen the TV shows I guess and might have read some basic instructions as part of prep training to work with it there, But she probably doesn’t have permissions. Heck there’s even the chance that Bex didn’t have the same luck as Mike and is dead (doubtful as there’s too much untold back-story there around her replies to Mike’s questions on her kids). He’s been on Mars for over 3 years actually, but yes, LEVi’s been on vacation for 3 months or so doing who knows what. And I think it’s safe to say that the ultrablue glow water is not 100% trustworthy. LEVi was also designed to resist a lot of types of corrosion but I don’t think anyone was expecting the chassis to be compromised to that degree… I tried to show some pitting on the surfaces from whatever has been at work on them. Yeah, exactly, they’ve only been at Devotion Base for 12 months (since it opened basically), prior to that he and Braid were doing research at another larger hab. He’s been off of Earth for about the maximum allowed time at this point, he’s supposed to be out in the next optimal window but, oops, Fisher found the fissure. Kallakore is devious and not to be trusted. 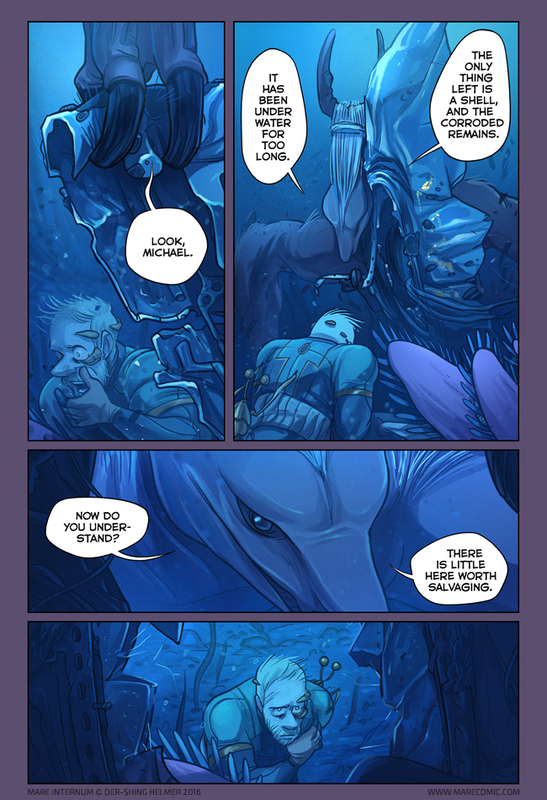 ….how do you talk under water. I think there’s either still part of an illusion, or telepathy capacity of sorts. Tightfriend seems a bit low on the body to allow to work as a babelfish translato—unless it’s the head mushrooms. uh. … lol I’m almost serious. How do you see the bonus comic? I go, I vote, nothing happens. Did you pick the option corresponding to the Captcha picture before you voted? If your network is as slow as mine it may take a while for the artwork to load, but it does show up eventually. does Armshark’s crest change when it’s underwater…. Cosplaying as Mike with a fully deployed thighfriend would be just about the worst costume idea ever. So why am I so tempted? Especially if you make thighfriend inflatable!! What if this is all an illusion? There is no water, and Levi isn’t really damaged. Kallakore is trying to deceive Mike. He/she/it has struck as possibly untrustworthy/sinister this whole time. This scene has crushed me.